Robert McFarland is a leadership consultant, executive coach, and conference speaker. Robert has worked with myriad organizations conducting strategic planning, providing branding guidance, and giving communications counsel. Robert is President of Transformational Impact LLC, a leadership development consultancy helping companies envision their preferred future, map the strategy to get there, and create the company culture to bring it to fruition. After serving evangelical ministries and nonprofits for 20 years as an executive, board member, and consultant, Robert founded Transformational Impact LLC to help for-profit companies and nonprofits capitalize on the power of their vision. Robert enjoys helping people change their thinking, so they can get the results they want at work and in life. His Impactful Lives blog at www.RobertMcFarland.net focuses on how intentional Christians can lead their thinking in their spiritual lives and in their professional lives to lead impactful lives. Robert serves as the Intentional Leadership Coach for the Intentional Living Center and is a frequent contributor to the Intentional Living broadcast and features. He is a member of the Board of Directors of the National Religious Broadcasters and the Chairman of the Board of Directors of The Family Foundation of Virginia. Robert and his wife, Tamitha, recently moved their six children out of the Washington, D.C. area to the Shenandoah Valley of Virginia, where they now wake up to the sound of cows instead of cars. 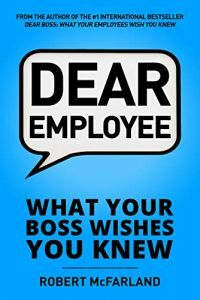 “Dear Boss: What Your Employees Wish You Knew” is his first book.